ANKARA, Turkey — After experiencing a decade of growth, Turkey’s increasingly vibrant defense industry may fall victim to the government’s quest to purchase the Russian S-400 surface-to-air missile defense system, a deal that will make Turkey the first NATO ally to deploy the system on its soil. Turkey announced in December 2017 it would acquire the Russian system for long-range air and anti-missile defense. Ankara has since ignored NATO allies’ calls to scrap the S-400 deal, citing its sovereign right to deploy any air defense architecture it chooses. Turkish President Recep Tayyip Erdoğan emphasized this point during a state visit to Moscow on April 8, saying that the S-400 deal is irrevocable. Turkey risks severe U.S. sanctions under the Countering America’s Adversaries Through Sanctions Act. Top U.S. lawmakers are threatening to pass legislation that would bar Turkey from buying the F-35 fighter jet, and sanction the country if it buys the Russian S-400. If Turkey accepts the S-400, “no F-35s will ever reach Turkish soil. And Turkish participation in the F-35 program, including manufacturing parts, repairing and servicing the fighters, will be terminated, taking Turkish companies out of the manufacturing and supply chain for the program,” wrote a bipartisan group of leaders of the Senate Armed Services Committee and Senate Foreign Relations Committee. “We are committed to taking all necessary legislative action to ensure this is the case. Turkey is an important partner in the F-35 program, but it is not irreplaceable,” the lawmakers added in their New York Times op-ed. But Ankara remains defiant. Turkish Foreign Minister Mevlüt Çavuşoğlu said April 10 that the country could open negotiations with Russia to purchase a second batch of S-400s. Turkey is a partner is the multinational, American-led Joint Strike Fighter program that builds the F-35. Turkey has committed to purchase more than 100 new-generation jets. Several Turkish companies are producing parts for the JSF program, including airframe structure and assemblies, landing gear components, and more than 100 F135 engine production parts to include titanium-integrated blade rotors. Industrial members also produce the missile remote interface unit, the panoramic cockpit display, center section wiring systems, airframe structures and assemblies, hardware for the jet’s F135 engine, and an advanced precision-guided standoff missile, which will be internally carried on the fifth-generation aircraft. Turkish Aerospace Industries, or TAI, supplies production hardware for the F-35. In conjunction with U.S. firm Northrup Grumman, TAI manufactures and assembles the center fuselages, produces composite skins and weapon bay doors, and manufactures fiber placement composite air inlet ducts. TAI also manufactures the jet’s air-to-ground pylons and adapters, which are considered alternate mission equipment, or military equipment that can be added or removed to aircraft depending on mission requirements. 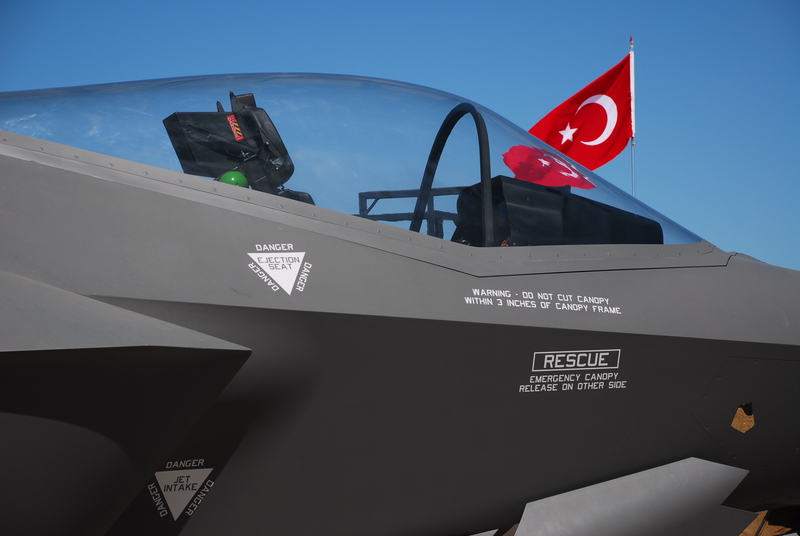 Other Turkish companies that produce parts for the F-35 are Alp Aviation, Ayesas, Fokker Elmo Turkey (in Izmir), Havelsan, Kale Aerospace, Roketsan, Tubitak Sage and Tusas Engine Industries. Additionally, the U.S. may disrupt Turkey’s current and future systems export efforts, including those for the T129 attack helicopter, built by TAI under license from the Italian-British firm AgustaWestland. The T129, based on its predecessor, the A129 Mangusta, is a twin-engine multirole attack helicopter. The T129 is powered by two LHTEC T800-4A turboshaft engines. Each engine can produce 1,014 kilowatts of power. The T800-4A is an export version of the CTS800 engine. LHTEC, which makes the engine, is a joint venture between the American company Honeywell and the British firm Rolls-Royce. Last year Turkey signed a $1.5 billion deal with Pakistan for the sale of 30 T129s. Turkey needs U.S. export licenses to make the T129 deliveries to Pakistan — or any other foreign buyer. In December, the Philippine government selected the T129 for military use, and talks are ongoing for the sale of eight helos.